With all the festive indulgence going on this season, there’s plenty places offering delectable Chinese New Year set menus. For something a little different, head over to KungFu Steam Seafood Restaurant for a feast of healthy seafood options. One may ask what Kungfu Steam is all about. It’s not your usual steamboat or hotopot if that’s what you are thinking. The owner brought in this concept from Hong Kong and China. New to our Malaysian shores, Kungfu Steam Seafood is all about enjoying the freshest ingredients steamed at your table. 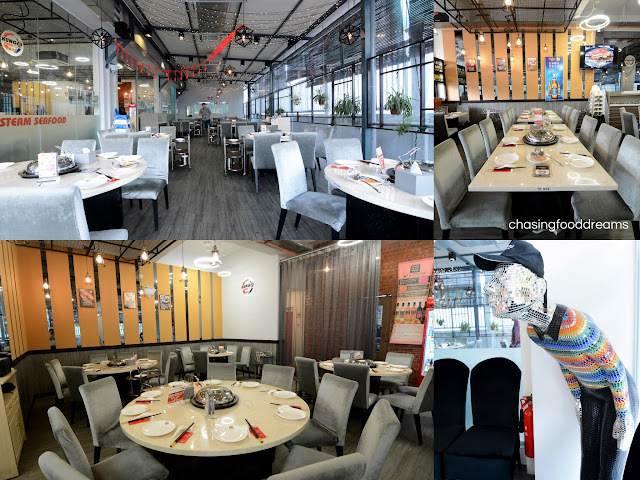 Encouraging Malaysians to enjoy healthy and fresh ingredients as well as spending time together during a meal is what Kungfu Steam Seafood dining is all about. Kungfu Steam Seafood original outlet in Sunway Mentari has been opened a year ago and the latest outlet today is in Bandar Puteri, Puchong. We paid the newest outlet a visit one weekend. It’s not hard to locate as Kungfu Steam Seafood is housed in a three-storey shop lot at The Cube. Parking is plenty in the evenings. Upon entering, one will see the Kungfu Steam Seafood Market on the side of the restaurant which houses lots of live seafood from premium fishes to crabs, prawns, clams and more. Kungfu Steam Seafood offers a main dining area on ground level with a cool ambiance or alfresco. There are four private dining rooms on the first level and there are minimum consumption value required for these private rooms. On the same level as the private room, there is also a children’s room where little ones can play as the adults enjoy their meal. Along the hallway, one would also see a station hosting a lot of sauces where diners can help themselves. During this New Lunar year, Kungfu Steam Seafood is offering 3 set menus for auspicious dining experience. 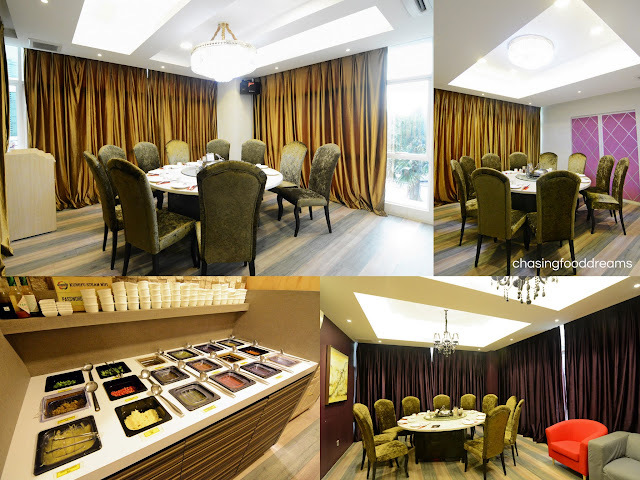 The set menus starts from RM638.80++ for 6 pax to RM1,688.80++ for 10 pax. Our dining for the evening was Set Menu B which is priced at RM1,088.80++ for 10 pax. Kungfu Steam Seafood cooking concept is all about perfecting the art of steaming. A special steamer appliance with digital control are fix on each table. Fresh ingredients are served and cooked according to the size and type as well as portion of ingredients by the wait staff. As soon as the ingredients are steamed, the cover is lifted and diners can enjoy themselves the freshly cooked ingredients. This is cooked and served by each ingredient because cooking timing is different. One can enjoy the natural flavours of the fresh meat and seafood or pair them with the various sauces available. Here are some of the sauces available at Kungfu Steam Seafood. These ranges from no heat to mild to super spicy ones such as Tema Sauce, Thai Green Chili Sauce and Sambal Sauce. There are also condiments such as fried shallot, chili padi, fresh garlic, fresh ginger, coriander, spring onion and more to concoct your own sauce. My favorite was the Tema Sauce and Thai Green Chili for its super kick of heat and moreish tangy flavours. 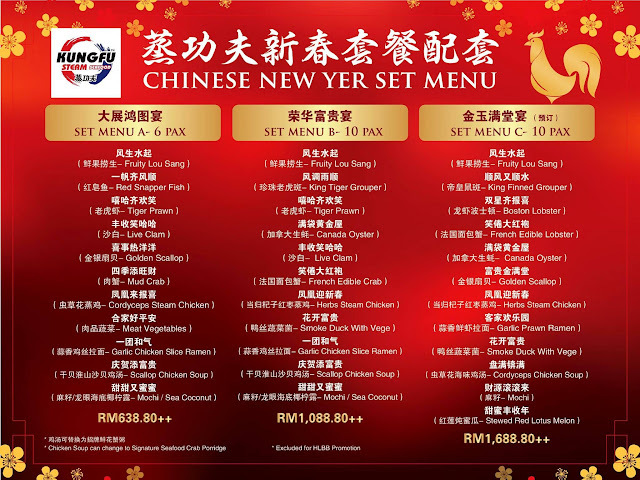 The Chinese New Year Set Menu offers various courses of meat and seafood that can be served in the order you wish. If you do not have a preference, the kitchen will serve the course as they deemed fit. Before the steaming starts, one is ask to choose from a choice of Scallop Chicken Soup or Signature Seafood Crab Porridge. Your choice will be placed into a pot beneath the steamer so that when the ingredients are being steamed, all the natural juices and flavours will drip below and flavour your choice of soup or porridge. There is a sense of excitement as we only get to see the final outcome at the end of all our ingredients. If you opt for the Scallop Chicken Soup, then you would see chicken, dried scallop and burdock root being placed into the pot to be transformed into a rich soup to be savored at the end of the meal. Kicking off the festive meal is Kungfu Steam Seafood’s Fruity Lou Sang. Indeed made mostly from fresh fruits and nuts, the yee sang is great for every one of all ages and for vegetarians too. Next course, a raw one of Canadian Oysters. Fresh large and plump oysters on ice, served with lemon and tobacco, tasted of oceanic flavours. The briny salty note is balanced by a subtle sweetness of these aphrodisiacs. Then the steaming starts with Live Clam. Little necks are steamed for a mere 3 minutes on the powerful steamer. Once they are cooked, these clams looked so good! Plump and utterly tender, the clams were sweet and juicy. They were so fresh and tasty that one may never even notice that there was no seasoning of salt, msg or oil on them. I also prefer them without any sauces since their natural flavours are so delicious. Tiger Prawn was next, a generous portion and sizeable crustaceans are carefully arranged on the steamer by the staff. French Mud Crab was next. The delicacy French edible crab is now quite popular in our shores. If I wasn’t mistaken, it only required an 8 minutes steaming and voila… beautifully cooked crab. The hard shell crab required more effort to dig into but the flesh was pretty decent and sweet. The legs of the crab had fine thorns so one needs to make sure they don’t get pricked by the thorns. The flesh was also rather delicate compared to the regular mud crab. There is also crab roe on the shells but they were not as creamy as the mud crab. This one pass muster though I would have preferred my regular mud crab. The Herbs Steam Chicken featured a beautiful pale yellow village chicken topped with Chinese herbs, ginger, red dates, wolfberries and spring onions. The cooked chicken was firm and fairly tender. Moist as well, I prefer the chicken with the sauces available as somehow the chook’s natural flavours didn’t stand out as much as the seafood. I enjoyed this with the Tema sauce and Thai Green Chili sauce or the kick of heat. The essential ‘yue’ course featured a lavish King Tiger Grouper. Every whole fish served at Kungfu Steam is literally swimming before its order. There is also a special method the fish is cut and serve to ensure that the fish is steam throughout evenly. With just some ginger shreds, spring onions and wolfberries, the King Tiger Grouper also had rather delicate flavours. The flesh was smooth, flaky and velvety while the skin had a lovely gelatinous bite. It’s certainly healthier and we can enjoy the natural light clean flavours of the fish. I also thought while its good to enjoy this fish on its own natural juices, I prefer the fish with some of the sauces just to enhance the fish flavours. A little soy sauce works on wonder on the fish. For greens, we had ‘Tau Miu’ in Smoked Duck with Vege. I like how they add smoked duck meat to the vegetable. Since the crisp Tau Miu is rather bland on its own, the smoked duck meat gave the vegetable a lovely smoky and savory note. This one was really yummy on its own. For the filler course, there is the Garlic Chicken Slice Ramen. The fresh ramen was paired with some chicken, long cabbage, baby corn and Shimeji mushrooms as well as wolfberries. Despite steaming it for a while, the ramen wasn’t overcooked or soggy. The QQ bite was pretty decent and the vegetables added crisp textures and sweet flavour to the noodles. The chicken wasn’t really noticeable though but I didn’t miss it as the noodles were pretty satisfying. Then it was time to check our Signature Seafood Crab Porridge! Once the steamer plate was lifted, we were all in awe of the beautiful sight of the bubbling porridge with the crab. The staff will also add on spring onions, ginger shreds, coriander to the porridge. The porridge was creamy and thick. The natural essences of seafood are well infused into the porridge and I can even taste the smoky duck flavour too. I added a little dash of white pepper and sesame oil and the porridge was perfect. And just when we thought we cannot finish this pot of porridge, we actually did because it was so tasty and comforting as an ending of the meal. The Chinese New Year Set Menu comes with Mochi & Chilled Sea Coconut as a sweet ending. Nothing to raved but nevertheless simple, refreshing and sweet. A really pleasant dining experience at Kungfu Steam Seafood! Ingredients are very fresh and portions are very decent. Prices are seemed higher but with the quality served, I personally feel its very value-for-money for such premium seafood. It’s also a healthier dining concept this festive season as all the ingredients are steamed without salt, msg or oil. The Set Menu B we had is affordably priced since it rounds up to about RM100 plus for each person for such a seafood feast! Awesome post for those who love to travel. good one.